Students, teachers, and parents from across the country are pleading with Education Secretary Betsy DeVos to do the one thing she has pledged not to do: examine the role guns play in school shootings—a very reasonable request! Unfortunately, DeVos was not present at the meeting. A metaphor! The New York Times reports that dozens of these concerned students, parents, and teachers spoke at a federal commission on school safety on Wednesday. Many expressed frustration with the Trump administration’s backwards approach to school safety, which includes bringing more guns into school and slashing funding for mental health programs. “What we will be doing is looking at specific age limits for the purchase of specific kinds of weapons and we will be examining legal procedures for the confiscation of weapons from people with identified mental health issues, so we will be looking at those narrow aspects of gun ownership,” Zais said. 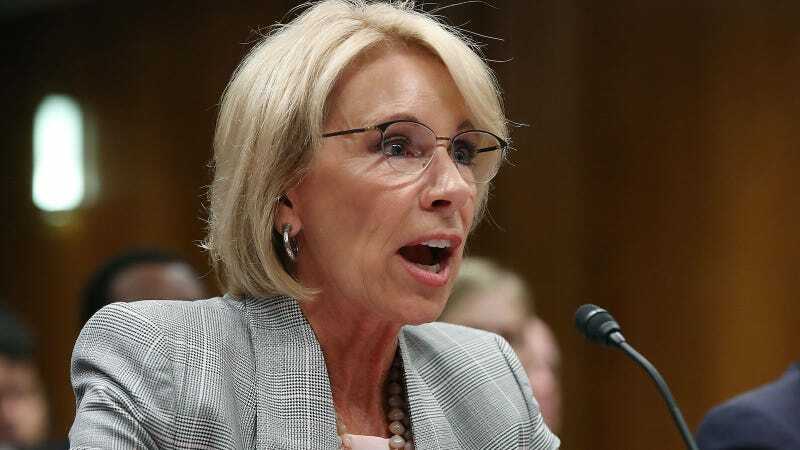 But DeVos has refused to consider that guns are a part of this conversation, as she told a Senate committee on Tuesday that the commission will “not, per se” focus on the impact guns have on school shootings. Three other cabinet secretaries—Attorney General Jeff Sessions, Health and Human Services Secretary Alex Azar, and Homeland Security Secretary Kristen Nielsen—who’ve been appointed to the panel also missed the meeting, according to the Times. Betsy DeVos: clearly a champion of students everywhere.